After launching BananoBet one of the top feature requests has been auto-bet. 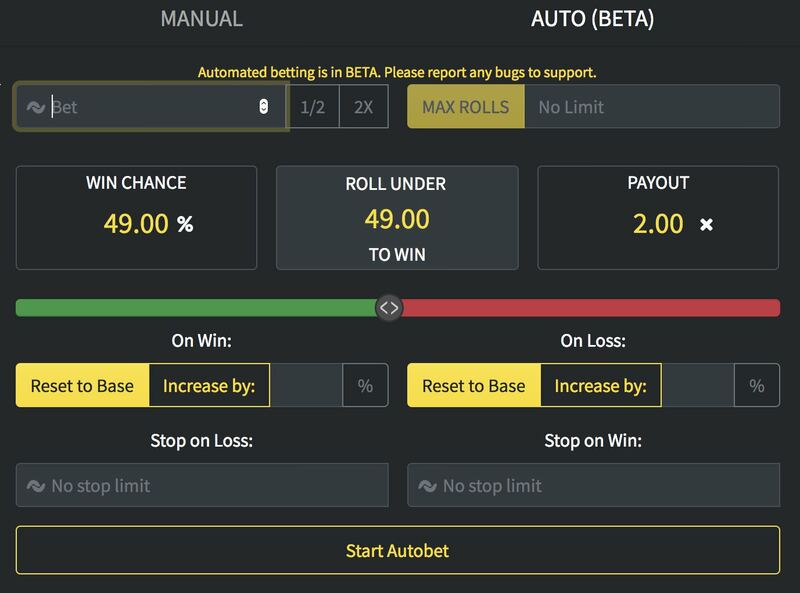 Today we are launching the beta version of AutoBet! You'll see a new option on the bet form, to access automated betting all you need to do is click on the "AUTO" text at the top. The amount you place as your "Bet" is referred to as your "Base" So if you start autobet with a bet of 50, if you set it to "Return to Base" on win, then every time you win the next bet in the sequence will reset to 50. If the server goes down for maintenance, your potential profit exceeds the max profit, your balance falls too low, or any other reason that causes a bet to not succeed - the autobet will be cancelled automatically. We hope you enjoy this feature, if you have any questions or issues feel free to contact support, ask in the chat, or ask on the BananoBet discord.